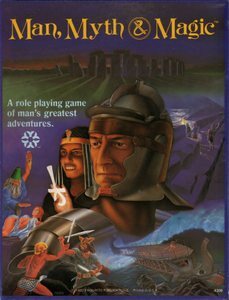 MM&M is a percentile-based RPG by little-known Yaquinto Publications. Game play is relatively simple, and the designer, author Herbie Brennan created a storytelling game, a concept well before its time. Episodes are loosely linked into a campaign, and can jump from time-to-time, mythos-to-mythos. Reincarnate as an Egyptian sorceror, a British Druid, even, perhaps an Irish Leprechaun to face the might and mysteries of the ancient world." Additional incarnations (nationalities, careers), equipment, combat rules, and spells. Some Advanced booklets were sold separately with a 3-panel card with scenario (Dragon Loose in Rome), a summary of the Basic Rules, and Advanced Character Sheet. 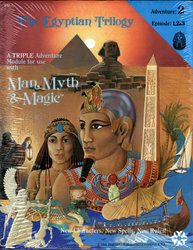 Adventure 1, Episode 5 for Man, Myth & Magic RPG. Adventure 1, Episode 6 for Man, Myth & Magic RPG. Adventure 1, Episode 7 for Man, Myth & Magic RPG. Adventure 1, Episode 8 for Man, Myth & Magic RPG. 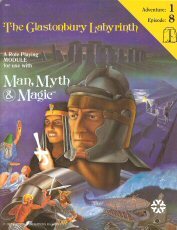 Adventure 1, Episode 9 for Man, Myth & Magic RPG. 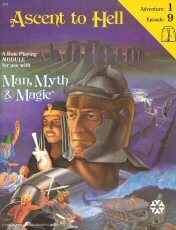 Adventure 2, Episodes 1-3 for Man, Myth & Magic RPG. "IT IS SPRING, 1375 B.C. * What powerful artifact was stolen from the Pharoah, Akhenaton? * Why Raneb, the loyal Chief Khemia to the House of Pharoah, took the artifact? * Why the one-armed Nomarch, Kephren Tes, seeks Raneb; but not what he stole? * Why Sek Met, the High Priest of Ra, will stop at nothing to possess the missing item? * Why the Pharoah's beautiful but estranged wife, Nefertiti, searches for both? * And finally, why you are a threat to all of them? * 31 New Character Classes, including Physicians and Alchemist! * Nearly 70 new Magic Spells, Charms, Amulets and Concoctions! * Dozens of new weapons and armor classes! Adventure 3 for Man, Myth & Magic RPG. The pale, full moon begins to rise, heralding another night of terror in the small, isolated village of Tharn Grivet. You, along with your hastily assembled comrades, check your seemingly useless weapons before posting guards and going to bed. Laying on your raised pallet, your mind is filled with the horror that grips this place. Somewhere, nearby a monster, virtually immume to weapons and magic alike is waiting to kill again: Each morning brings the discovery of a new, mangled body, today the victim had been one of your comrades who had been guarding in the predawn hours. Suddenly the night is shattered by a shrill howling. Grimly determined and sickeningly afraid, you leap from your bed, grab your pitiful weapons, and move out into the erie night. As your small group assembles their faces are filled with resolve. There have been too many deaths already, there can be no more. Tonight, for better or for worse, you will find... 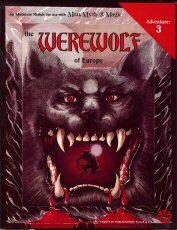 The Werewolf of Europe"
"Yesterday you travelled to 600,000,000 AD and solved a bizarre murder mystery. Today you watch, amazed, as the merchants of Gomorrah trade in vice and corruption. Tomorrow you will stalk the war-torn streets of Berlin in search of Adolph Hitler. You are a time traveller, and there are no more barriers when you play..."
Another innovative role playing game by Herbie Brennan, released by Yaquinto Publications. 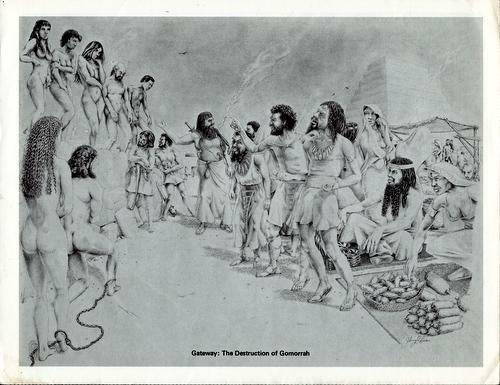 Pictured is one of the pages of player handouts, titled "Gateway: The Destruction of Gomorrah." "TIMESHIP is an innovative and imaginative role playing game that allows players to adventure in strange eras and places as themselves, not as fictional characters who have been created by a few dice rolls. An elegantly simple system starts players at average ability levels, then allows each player to evaluate him or herself by improving some and reducing others. The result is each player creates a gaming character that mirrors both their positive and negative abilities, based on their own judgment. TIMESHIP also introduces the concept of Player Power. Each player has a certain amount of Personal Power that is reduced through the performance of various activities and damage during the course of the adventure. For instance; a player could take a hand gun into a twentieth century adventure at minimal Power cost, should that same gun be taken on an excursion into the 10th Century, the Power cost would be enormous. Another aspect of Personal Power concerns Group Energy, the element that activates the portals, or gateways, allowing players to move in and out of time itself. 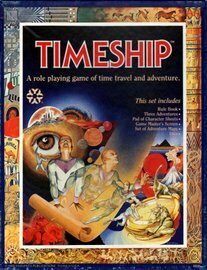 TIMESHIP, like all other role playing games requires a judge, or game master, called the Timelord'. 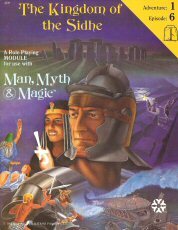 The Timelord, using the rules, adventure modules and imaginations of the players, conducts the group into the past present or future. In addition to the THREE modules, or Time Capsules', that are enclosed with the game, Timeship is wide open to creating your own adventures. You are free to roam the ages. Journey from the days of the dinosaurs, to the mystics of the ancient world, to the glory of Napoleon. If the past is not enough, adventure in the present with its political intrigue, and brushfire wars; or, for those more adventurous souls, you may transcend the present and visit the future where man's home is the universe, populated with all manner of strange and alien beings. The potential for adventure and excitement is only limited by your imagination. Murder at the End of Time. The date is 25 August, 600,000,000 A.D. and you stand beneath a blazing, un-moving sun. No crime has been committed on Earth for more than three hundred million years; until now! Your mission is to solve the mystery using the bizarre clues and peculiar witnesses. Assassinate the Fuhrer! On June 7th, 1956, World War Three began when the Nazi government of Argentina, led by Adolph Hitler, invaded Brazil. Hitler had escaped capture at the end of World War II and begun the Fourth Reich in South America. It is now April 30th, 1945 and you are stalking Hitler through the bunkers beneath a city in flames. Your mission: find him, then make it look like suicide. The Destruction of Gomorrah. It is May 22nd, 1979 B.C. and you are surrounded by the sights and sounds of the doomed city, Gomorrah, famous for its vice and corruption. You arrived on a simple 'Time Traveller's Holiday'; but find you must now stop the destruction to save yourself!"